Astronomers think that the expansion of the universe is regulated by both the force of gravity, and a mysterious dark energy. 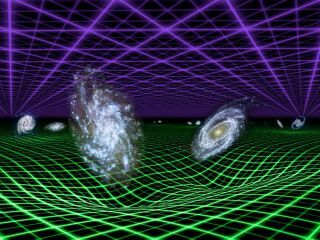 In this artist's conception, dark energy is represented by the purple grid above, and gravity by the green grid below. Let's talk about dark energy. We've known for about 20 years that the expansion of our universe is accelerating; every day, our cosmos grows bigger and bigger, doing so faster and faster. It's a subtle effect, and it takes extensive and deep cosmological surveys and studies for scientists to notice it. But multiple independent lines of evidence all point to the same conclusion: accelerating expansion. We use general relativity, Albert Einstein's magnum opus, to understand gravity in all its manifestations, including the expansion of the universe. But the theory's equations have some wiggle room. Specifically, they allow for a so-called "cosmological constant," a fixed term that can be appended to the end. Adding this constant doesn't change the theory's descriptions of normal, everyday gravitational interactions, but it does make itself known when you're calculating the expansion of the universe. Our natural inclination would be to set this constant to zero and forget about it, but Einstein himself introduced it because he found that without it, his relativity predicted a dynamic universe. At the time, both physicists and the general public thought of the cosmos as static and unchanging, so Einstein set a value for the constant to prevent those dynamic predictions. And then astronomer Edwin Hubble showed everyone that we do indeed live in an expanding universe, and Einstein realized that he'd missed a golden opportunity to predict that revolutionary observation. Oh, well. But nowadays, we're faced with accelerated expansion, and the simplest explanation we have for it is that is that dark energy is simply Einstein's original cosmological constant. But the constant by itself is just a number — what's its physical significance? In the 1960s, Soviet astrophysicist and all-around-genius Yakov Zel'dovich made a startling connection. The cosmological constant that appears in Einstein's equations is none other than the vacuum energy that quantum field theory predicts. According to that theory, a suite of quantum fields permeates all of space-time. Sometimes, portions of these fields get excited and move around, and this is what we identify as particles. But left unperturbed, the fields are still associated with an energy. In other words, the empty vacuum of space-time has a raw energy, and that energy can be identified a the cosmological constant in general relativity, which means it might be the dark energy itself. So, now that we have some sort of trail to follow, what do we predict the value of dark energy to be? The math isn't easy, but you just have to turn the quantum field theory crank, and out pops … infinity. Well, that's not going to work. There are games you can play to make the predicted value for dark energy not infinity, but no matter what you do, you always end up with a very large number. But what about the actual, observed amount of dark energy, the one calculated from the accelerated expansion rate? It's very small: the energy equivalent of a little less than 1 hydrogen atom per cubic meter (35 cubic feet). That "minor" discrepancy between dark energy's predicted value and the observed expansion rate is one of the biggest puzzles in modern physics. And its full resolution will probably come only with a true reckoning between quantum mechanics and general relativity. Until then, we should probably understand how a vacuum energy can accelerate expansion. This is one of those weird cases in which the math behind the physics is totally straightforward and unambiguous: Simply put, a constant vacuum energy causes the expansion of the universe to accelerate. But putting this conclusion into words so that we can intuitively understand it is another matter entirely, one that cosmologists have struggled with for decades. I'm going to give it a shot myself, but if you just want to say to yourself, "because the math says so," and skip to the next section, I won't blame you. Two key properties of a vacuum energy affect expansion. One is the vacuum's persistence; as the universe expands, there's more space, so there's more vacuum, so there's more vacuum energy. So, in our evolving cosmos, we find more and more dark energy lying around. The second vacuum property that's key for expansion is that the vacuum has tension (usually, confusingly, referred to as "negative pressure," but same deal). This tension resists the expansion of the universe; it's trying to rein in the expanding cosmos. Put these two properties together and you get the complete opposite of what you may expect. This is because the equations of general relativity count all sources of energy to determine the behavior of the expansion of the universe, and different sources of energy can contribute positive or negative effects. So, the raw energy of the vacuum gets counted, which would be an attractive contribution, slowing down the expansion of the universe. But so does the vacuum's tension, which actually contributes repulsively., In other words, in the math of general relativity, the tension from dark energy carries a minus sign with it, and contributes to accelerating the expansion of the universe). It turns out that general relativity cares more about pressure and tension than raw energy. This is something wholly unfamiliar to us in our everyday experience; in almost all other cases, such as the motions in the solar system or even in the vicinity of black holes, the pressure/tension doesn't matter in the calculation. But it matters here. The ultimate irony is that even though we're getting more and more dark energy every day, which would normally try to shrink the cosmos, its own resistance to that expansion causes the whole equation to flip around and instead accelerate the universe's growth. The above explanation may or may not have been satisfying. Again, the math is clear, but there is no simple way to translate those equations to English. Nevertheless, the behavior of vacuum energy is currently our best explanation for the accelerating expansion of the universe. And it's not the greatest one. As we saw, we are severely lacking in our ability to predict the amount of acceleration. While the existence of dark energy is beyond doubt, its cause is ultimately unknown. We have some likely suspects but no hard evidence. We need more sleuthing, measuring the universe's expansion rate and the history of the expansion rate to ever-greater precision. But because dark energy is a very subtle effect, it will take an entirely new generation of observations to (hopefully) reveal some answers. Learn more by listening to the episode "How Does Dark Energy Accelerate the Universe?" on the "Ask a Spaceman" podcast, available on iTunes and on the web at http://www.askaspaceman.com. Thanks to Siri L., Oscar Z., Olivia P., Solly F., Peter W., Scott M., Mallet, Smuel, chrissscottt, Colin E., Dana R., Lindsay F., Rowan H., Robert R., ozderecko and Sam B. for the questions that led to this piece! Ask your own question on Twitter using #AskASpaceman or by following Paul @PaulMattSutter and at facebook.com/PaulMattSutter. Follow us on Twitter @Spacedotcom and on Facebook. Original article on Space.com.